This NCAA men’s ice hockey tournament is one of the best competitions the league has seen in a while. And it probably has something to do with the explosion of NHL draft picks staying to play a year or two of college hockey. Hockey East sent the No. 13 Boston University, No. 8 Northeastern University and No. 7 Providence College men’s hockey teams to the 2018 NCAA Tournament. BU and Providence made it to the second round while Northeastern fell short in its first matchup against the No. 10 University of Michigan. The Terriers upset the No. 1 seed and No. 4 Cornell University in the first round, scoring three unanswered goals after Cornell struck first in the second period. All three scorers — freshmen forwards Shane Bowers and Logan Cockerill and freshman defenseman David Farrance — were drafted in the 2017 NHL Entry Draft. BU couldn’t hold up to the strength of Michigan’s offense in Sunday’s Northeast Regional finals matchup. The Wolverines scored three goals during the third period, and it was too much for the Terriers to come back from. Junior forward and assistant captain Jordan Greenway, drafted by the Minnesota Wild in 2015, was the first to strike for BU in the opening period. Greenway recently spent the beginning of February representing Team USA in Pyeongchang, South Korea during the 2018 Winter Olympics. When the NHL didn’t stop the season for the Olympics, college players like Greenway were given the opportunity to play. The decision came around a year ago, which didn’t give a lot of time to deal with how to make up for the loss of the speed and strength that Greenway brings to the Terriers. Greenway missed the second game of the 2018 Beanpot tournament this year to play in the Olympics, but it gave him the opportunity to be the first African-American hockey player to represent Team USA. When the Terriers lost to the Friars in the 2015 finals, the team looked much different. Seven players on the roster had been drafted by NHL teams. This season, 12 Terriers are signed to a professional organization. It’s a big jump in only three years, but it’s a phenomenon that’s growing at every Division I hockey school. 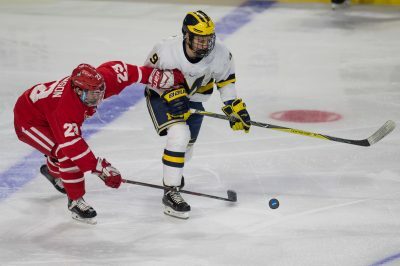 Jack Eichel, a freshman on the 2014-15 squad, was one of the first big success stories of the “one and done” college experience that is mostly seen in basketball. After his first year at BU, he was the No. 2 pick in the 2015 NHL Entry Draft and has been with the Buffalo Sabres ever since. Unlike in the NBA, players in the NHL can enter the draft and the league regardless of years in college. Spending at least one year in college is good for a lot of players. It helps them mature a little and find their feet before they enter a professional organization. On the other hand, it’s hard to deny players like Auston Matthews, Sidney Crosby and John Tavares of their destiny to play professionally. In every realm of sports, the NCAA is pushing for players to spend at least a year in college before moving on to their professional destinations. In hockey though, it’s not as simple. The NBA is exploding with talent right now. It’s a tough fight to enter the league, and once you get there, the competition is harder. The NHL has definitely grown in recent years, but the draft isn’t as intense as the NBA. If you’re a spectacular talent, entering the league is not only ideal for your playing career, but for your organization. The NCAA push to enroll more student athletes who have professional playing potential is also a great collaboration with the NHL. Instead of having these players in AHL or ECHL affiliates, NHL franchises can rely on college teams to take good care of their players until the professional team is ready to take them. At any level and in any sport, the NCAA is marketed as a good environment for athletes to grow as players and students. The front page of their website outlines their priorities of academics, well-being and fairness. There’s no mention of players becoming better athletes in the descriptions, which is actually kind of awesome. Professional leagues are a tough transition for any athlete, no matter if you’re chosen first or last in the draft. But the hardest transition, proven time and time again, is the transition from sport to real life. Whether that transition happens after a four-year stint in college or a 15-year reign in a professional league, it’s a scary concept for many athletes. The NCAA is trying to tackle the issue of “life after sport” from the get-go. Every player is important to them, regardless of their future as athletes. That’s the kind of nest egg that leagues should be building. Safety of athletes is the priority, and the NHL is certainly behind that mantra.